Hey there ! 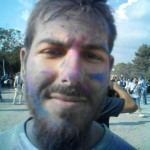 I'm Panagiotis from Thessaloniki, Greece. You might know me as panagiks or Lonas, or maybe not. I'm a Computer Science and Informatics student at AUTH. I'm interested in network architecture and managment and also in game development. I'm a Firefox Student Ambassador. As for my hobbies I love embeded systems and computer games. The first of my two hobbies had as a result my active involvement with the local Tech Communities. Through this involvement I met some great people from different backgrounds and in 2015 we Co-Founded TechMinistry - Thessaloniki's Hackerspace. Panagiotis is one of the most active contributors in the local community around web literacy, privacy and a very promising Firefox Student Ambassador.